One of our missions is to reveal your inner beauty, revitalize your confidence, and make your vision a reality. As industry leaders, we offer the most innovative and cost-effective programs in laser aesthetics, weight loss, beauty, and total body wellness. Our Lifestyle Coaching Program helps you make this a permanent solution. Clients experience an ambiance of true relaxation during their time with us. All individualized programs are safe, painless, and extremely effective in providing clients with real results. Low levels of laser energy supercharge your lymphatic system (body’s natural metabolism) and stimulate the fat cells to open and release intra-cellular fat. Most weight loss laser systems only target fat tissue that’s up to 10 millimeters below your skin’s surface. When the laser hits fat cells, it forces them to break down. Your body gradually starts removing the destroyed fat cells. While penetration up to 10 millimeters can certainly burn off fat, it only gets rid of superficial fat. Invisa-RED penetrates even deeper, as much as 40 millimeters. The system’s unique combination of pulsed red and infrared laser technology triggers your lymphatic system, which gets rid of broken down fat cells. The pulsed laser system also stimulates your body’s metabolism. So not only does Invisa-RED destroy fat cells permanently, it forces your body to continue breaking down fat and burning energy. In an industry where one size fits all concepts are typical, we’ve opened the door to a new way of thinking and a lifetime of results. We have taken a truly individualized approach by combining multiple, successful components into a long-term REAL solution. 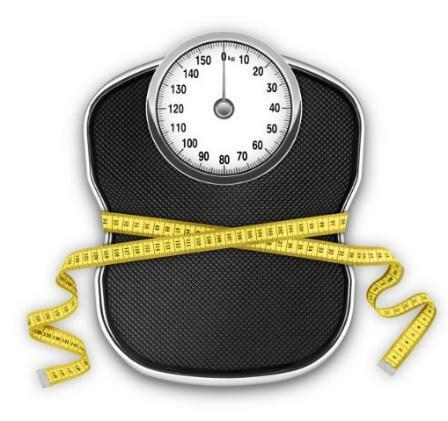 Clients safely lose on average 2 – 3 lbs. Per week. All of our weight loss programs are individualized and based on our clients’ needs. We can help anyone lose weight safely and permanently regardless of time constraints, medical conditions, lifestyle and budget. Let’s be real for once. Weight Loss Is Not Your Life. Your Life Is Family, Work, Hobbies etc… Weight loss just has to be incorporated into your life. Lipo laser technology for weight loss has been utilized since the early 90’s as a safe, non-invasive, painless, and effective way to accelerate weight loss; remove unwanted fat from undesirable or unresponsive areas, tighten and rejuvenate skin, fade stretch marks and scarring, and smooth cellulite from all regions of the body. Low Laser Light Therapy (LLLT) is the latest innovation in body slimming technology used to remove fat from areas that are unresponsive to diet and exercise and reshape regions of your body very quickly. Our innovative technology is a safe, non-invasive, and painless alternative to traditional fat reduction procedures. Each session can remove up to an inch of unwanted fat from any undesired problem area(s). Treatments are ideal for both men and women, eliminating the fatty areas that are unresponsive to diet and exercise. Most clients will see results after their first treatment. Subcutaneous fat (fat cells between the skin and the muscle) is what your body utilizes when it needs energy. When the body metabolizes fat from the subcutaneous fat it will utilize the fat cells that are closest to the muscle first. 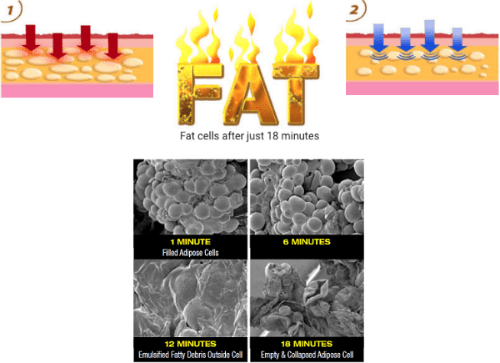 These fat cells are located the farthest from the skin. Most people rarely utilize the fat from the cells closest to the skin. These cells are larger due to the amount of stored fat inside that is never metabolized in the body. Concentrated laser energy safely and painlessly activates the fat cells closest to the skin to open and stimulates the body’s metabolism to utilize the stored fat as energy. The fat that is not utilized for energy is then eliminated from the body through the lymphatic system naturally. Treatments will vary depending on several factors including, skin tone, elasticity and cellulite grading. Multiple treatments are necessary two times per week for optimal results. Treatment times can last about 15 minutes per session. Treatment sessions will vary from client to client. During your private consultation, our staff can give you a better idea of how many treatments you will need to achieve your desired results. No. Treatments are non-surgical, non-evasive and pleasant. Clients will listen to music, Facebook, text or take a nap during treatments. Our professional staff is here to ensure each session is relaxing and comfortable for you. Any area of the body that is non-responsive to diet and exercise can be reduced and contoured effectively. The most common areas are the waist, back, arms, legs, hips, thighs, buttocks, chin and neck. Stretch marks are caused, literally, by rapid stretching of the skin. Micro tears develop and the blood vessels that lie under your skin show through usually creating stretch marks that are red in color. If the body is slow to produce enough collagen to repair the area the appearance of the stretch marks usually become darker in color. Pregnancy and weight loss/gain are the most common reasons stretch marks develop. Low Laser Light Therapy technology will stimulate RNA and DNA production (skin cell renewal) rejuvenating your skin and promotes the growth of collagen to repair the damaged area. Most clients will see an improvement after just one treatment but will require multiple sessions to reach their desired goals. Once you have completed your treatment schedule we recommend you come in for touch up treatments once a month for three months. Clients are welcome to come back as needed for any additional touch up treatments after maintenance is complete. Cellulite is caused by enlarged fat cells that are unresponsive to diet and exercise causing a dimpling effect. The pulsing laser light activates the enlarged fat cells to open, allowing the contents to leave the cell and be utilized in the body’s natural metabolism. The fat that is not utilized will then be eliminated through the lymphatic system. The result is a smooth cellulite free area of the body. Although you can see visible results in just one treatment, you’ll see optimal results after multiple short treatments which are recommended two to three times per week for the duration of your treatment schedule. Not only will you notice a reduction in cellulite, but you’ll also see a reduction in the circumference of your treatment area, as well as an improvement in the skin’s texture. No. The treatments are non-surgical, non-evasive and pleasant. Our treatments are very relaxing, and studies show the effectiveness of Low Laser Light Therapy in cellulite reduction without any of the side effects of evasive procedures. Clients will listen to music, Facebook, text or take a nap during treatments. Our professional staff is here to make you very comfortable during each treatment with us. Any area of the body can be treated. The most common areas are the back of legs, hips, thighs, buttocks, chin, and neck. Visible and Infrared light, at wavelengths from 650nm to 940nm, penetrates tissue to a depth of about 10 to 40 mm. Light at this wavelength is very beneficial in treating problems close to the surface such as cellulite, stretch marks, scars, skin elasticity, collagen production, wrinkles, acne and is particularly effective in removing fat from unwanted problem areas. Increases blood capillary circulation and vascular activity by promoting improvement in the metabolism of nitric oxide (NO). This facilitates improved regulation of vasodilatation and leads to the formation of new capillaries – This, in turn, provides additional oxygen and nutrients to accelerate natural tissue healing processes and eventually evokes a cascade of beneficial biochemical processes. Stimulates synthesis of adenosine triphosphate (ATP)—an immediate energy source for muscle contraction and essential in the metabolism of all cellular processes and sustainable living systems. Is weight loss with Invisa-RED permanent? Yes. Adults have the same amount of fat cells, even after dieting and exercising. Typically, when you lose weight, your fat cells shrink, making you have a slimmer physique. Invisa-RED is different. It penetrates and destroys fat cells, triggering your body to get rid of them. The fat loss is permanent! You can even come in for routine visits or occasional diet assistance after you reach your goal weight, just to help maintain your new body. Q. Are Low Light Laser Therapy (LLLT) treatments safe? A. Low light laser energy is part of the range of electromagnetic rays that are necessary for metabolism and growth of human beings and is also part of the natural light spectrum of sunlight minus the skin-damaging UV rays, which is why NASA currently uses this type of energy in space. It is also vibration energy, with which the human body resonates. This is the reason that it can penetrate through the skin. Q. I don’t know much about Low Laser Light Therapy, can you explain it to me? A. Low Laser Light Therapy produces red and infrared (650nm – 940nm). The human cells have light-sensitive chemicals called chromophores which react to light in the 600nm – 900nm range. When stimulated by energy in this range, the cells produce more ATP which is the energy source that powers every muscle and increases metabolism. Red laser light also causes DNA synthesis in the fibroblasts of the cells which makes the skin more elastic and younger looking. 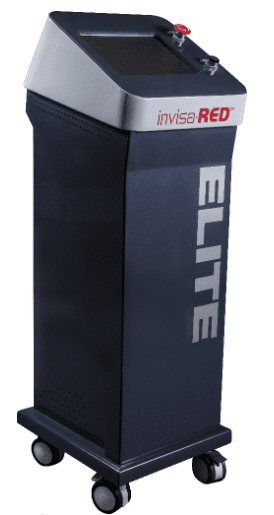 In addition, near-infrared light promotes cellular healing, thus reducing the recovery time after a workout. Low Laser Light Therapy is used without exercise while relaxing and is very effective in heating up the body. Laser Lipo accelerates the body’s natural detoxification processes. Q.How long has this technology been around? A. Low Laser Light Therapy in a similar fashion has been used in Europe and Asia since 1999. It is only now catching on in North America.